"Meet the first modern family." The Croods is a U.S. animated 3D comedy movie that was written by Chris Sanders and Kirk DeMicco. The movie was produced by Kristine Belson and Jane Hartwell for DreamWorks Animation. The cast includes Nicolas Cage who plays Grug, the erstwhile leader of a family of cave people. Catherine Keener is his wife, Ugga. She is more open-minded than her husband, but it is still hard for her to keep the family safe. Emma Stone plays Eep, Grug and Ugga's eldest cavegirl daughter. She is eternally curious and always seeking adventure. Clark Duke is Thunk, the family son. At 6 foot 9 and 320 pounds, he is the largest and only 9 years old. His size makes it awkward for him to get around without disrupting something, but his intentions are good. Ryan Reynolds plays Guy, a caveboy nomad who is more brain powered than physically strong and travels with his pet, Belt. Cloris Leachman is 45 year old Gran, a strong cavewoman who is Grug's mother in law. Also present is Sandy, the baby daughter who bites and growls. The story focuses upon Grug's battle against Guy, the new guy on the block. He is seen as as a threat by Grug when he showcases his inventions like fire. The family must survive the volcanic world they live in which is a challenge every day. To complicate matters, Grug has a very rude awakening when a massive earthquake causes him to move on from the only life he has ever known. With his entire family, he beings a venture out to find them a new home. The situation becomes more complex when his daughter and family fall for the nomadic young man called Guy, whom they meet while on their perilous journey. Guy is the exact opposite of Grug, given his imaginative, quirky and creative nature in search of a better and more livable future for all of mankind. 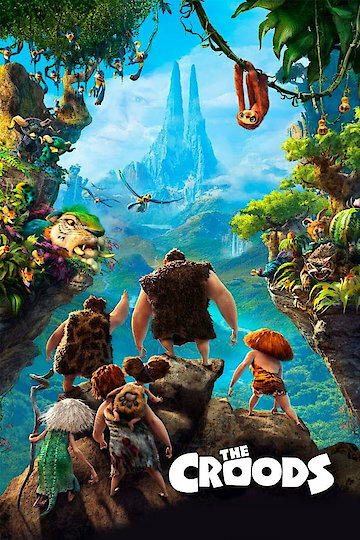 The Croods is currently available to watch and stream, download, buy on demand at FX+, FOX, Amazon, Vudu, Google Play, iTunes, YouTube VOD online. Which films made it to the top ten over the weekend? In Theaters This Weekend: 'The Croods', and More! In theaters this weekend: "The Croods", and more! See what's opening in a theater near you!